You might recognize long-drive champion Troy Mullins from the 398-yard drive that she unleashed at the Mile High Showdown last summer. But you almost certainly will not recognize her as Grandma Gladys in the following Skratch TV video. 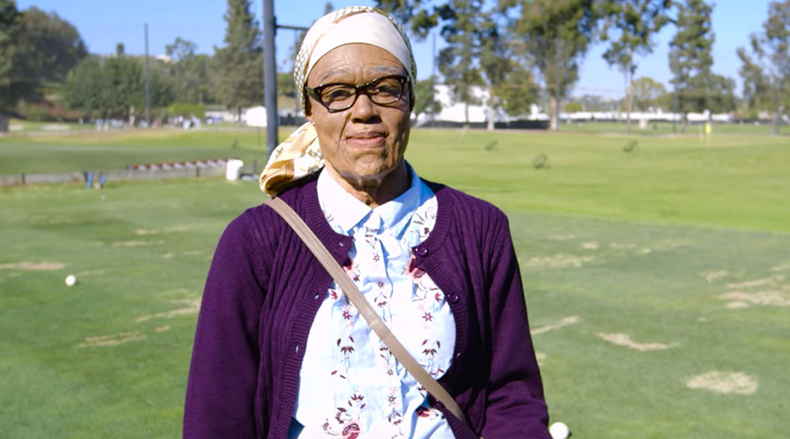 To dupe a crowd of unsuspecting junior golfers (and instructors) at a youth golf clinic prior to the Genesis Open last month, Mullins disguised herself as an elderly lady. And she definitely looked the part, thanks to a gruelling four-hour makeup and skin prosthetics session. It seemed like none of the junior golfers or instructors on hand expected Gladys to hit the ball more than 50 yards, especially after she intentionally made feeble contact with her first swing. However, that changed in a hurry when Gladys asked her “granddaughter” to hold her purse and then started striping drives over 300 yards! Those long bombs drew cheers and priceless smiles from everyone in attendance, and even caused the youngsters to break out into a “Grandma!” chant at one point. 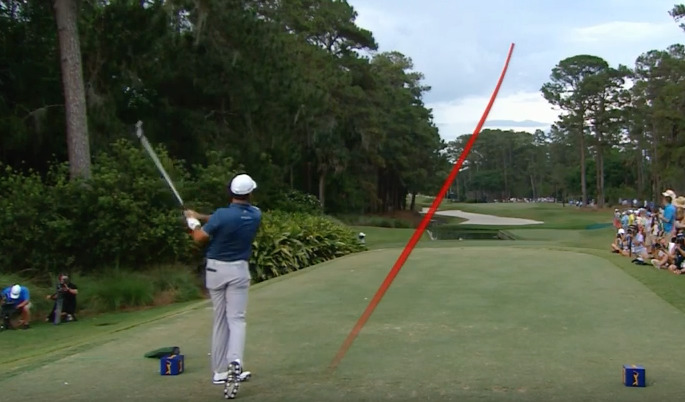 CBS announced last week that shot-tracer technology would be incorporated into this weekend’s broadcast of the Masters. The technology will be used on the 9th, 10th, 13th, 15th, and 18th holes during the third and fourth rounds, giving fans at home a better perspective of the action. “We’re trying to blend in the technology with out traditional coverage,” said CBS chairman Sean McManus. “We’ve had good success with this on our digital platforms, and we think the time is right to introduce it into our regular coverage on Saturday and Sunday.” Fans have been asking for shot-tracing technology at the Masters for years, and it is refreshing to see Augusta National acquiesce to popular demand every once in a while. Hopefully, the Masters tournament committee will see how much this technology enhances the viewer experience during this week’s broadcast and will agree to implement shot-trackers for all four rounds in the future. PGA Tour rookie Maverick McNealy might be best known for tying Tiger’s record for most total victories at Stanford and for being the son of billionaire Sun Microsystems co-founder, Scott McNealy. But around the circuit, the Californian is best known for his love of hockey and of the San Jose Sharks. McNealy played hockey throughout his youth for both the San Jose Jr. Sharks and his high school team. So, when Golf Digest interviewed him last week in Las Vegas, they asked the 22-year-old to suit up and join them on the ice for a Happy Gilmore Golf Hockey Challenge. In the video, McNealy answered several rapid-fire questions about himself while stickhandling golf balls around pylons and putting from centre ice, as well as pitching shots over the boards, across the ice, and into an empty net. Several interesting tidbits emerged during the interview - i.e. that he and his siblings were all named after American cars and how he prefers Slapshot to Caddyshack! Check out the entire interview below. Rickie Fowler got off to a great start at the Shell Houston Open with rounds of 66 and 68 on Thursday and Friday. But the Murrieta, California native got derailed on Moving Day when a 13-foot par putt on the 13th hole turned into a four-putt fiasco and a triple bogey. 4 putts from 13 feet for Rickie Fowler. Want to feel bad about the current state of your golf game? Then watch this pyjama-clad toddler snipe a Pringles cans from across his living room with what appears to be a plastic 1-iron. Beau Hossler looked like he had his first PGA Tour victory all sewn up on the 72nd hole of the Houston Open until Ian Poulter drained this clutch 20-foot birdie putt to force a playoff.